We developed the Ideal 70 and eco-tech 70 as a dedicated 70mm system for the UK. Fully sculptured it delivers exceptionally clean and slim sightlines and the flexibility and subtlety for use in retail, new build and specification sectors. German-engineered, its strong aesthetics are underpinned by a technically advanced energy efficient five chamber system, which easily achieves top BFRC A+ ratings. With one of the world’s most advanced and largest production bases delivering scale, we can offer not just incredible technical innovation but also value. The Ideal 70 and ecotech 70 combine great aesthetics with a top WER A+ rating to bring one of the world’s most advanced window and door systems to UK fabricators and installers. The Ideal 70 offers a premium quality finish. A pioneering system means that aluplast can also guarantee performance eco-tech 70 recycled content options. The Ideal 70 has a full range of beading options from a 24mm to a flush fitting 44mm bead, double and triple-glazed options are easily accommodated to achieve a WER A+ rating. A 23mm rebate with an 8mm cover gives an optimum weathering performance. – The Ideal 70’s fully sculptured 70mm five chamber system provides excellent insulation to achieve a WER A++ rating. 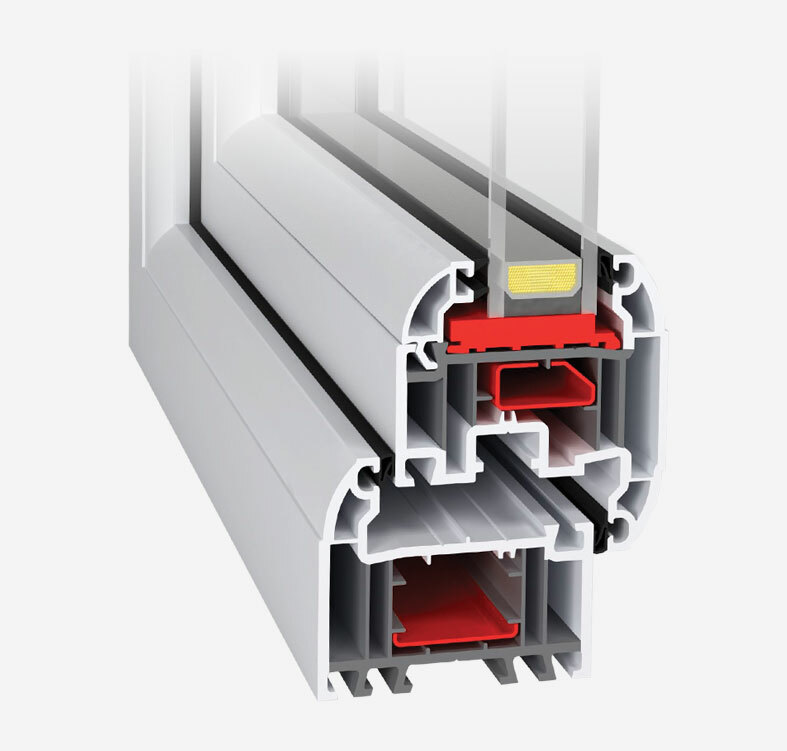 eco-tech 70 delivers a step-change in the use of recycled material and content in a new generation of sustainable and energy efficient PVC-U windows and doors. We extrude recycled and virgin material simultaneously through a single dye to create a single profile. This locks recycled material away from areas of the frame visible to the end-user or which perform a structural role. It allows us to utilise a high percentage of recycled content but to guarantee surface appearance, finish, quality and depth of gloss. The surface is perfect – no pits, no extrusion lines. With an A+ rating for material type from the Building Research Establishment in its Green Guide, it makes the eco-tech 70 among the UK’s most sustainable window and door system options. From traditional sliding to lift-and-slide systems, aluplast low maintenance and energy efficient PVC sliding patio doors, offer the perfect solution for your home. Lift-and-slide, triple or double track – we offer one of the UK’s most competitive inline sliding patio door offers. Slim sightlines, high thermal performance and manufacturing efficiencies make aluplast PVC-U bi-folds the system of choice. Packed with manufacturing and installation innovations the Ideal 70 brings innovation to a product classic. Our fully sculptured PVC French door system brings classic design and traditional detailing to a consistently popular product. Low maintenance, achieving top WER A+ ratings, our low maintenance PVC-window ranges are given new design flexibility with one of the UK’s widest foil ranges. Composite, or glass or PVC-U panel, our door framing systems are designed to work seamlessly with the UK’s leading hardware systems. Retaining enduring popularity in specification, our tilt & turn system achieves WER A+ ratings, while delivering a raft of manufacturing and installation efficiencies.